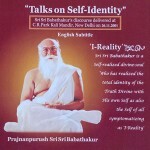 Saccidananda Society has published one Video CD so far containing the revealed spiritual discourse by the Master at C.R. Park Kali Mandir, New Delhi on November 26, 2001. There are many more yet to be published. There are two documentary films on Prajnanpurush Sri Sri Babathakur released so far.